GROWTH has identified its intent to redevelop the former Zimmerman Honda car dealership site at 1740 5th Avenue into a mixed use development known as Zimmerman Lofts. 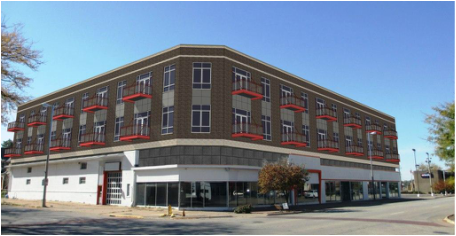 The $12.1 million project includes the construction of 45 residential upper story, new construction upper story rental units, with over 21,000 square feet of first floor commercial space. Residential units will offer studios, one bedroom/one bath, and two bedroom/ two bath units with monthly rent ranging from $230- $1,050. GROWTH intends to create market driven housing that will ignite additional investment in the downtown. As an experienced community-based developer having built nearly 230 units of downtown housing in Rock Island, GROWTH has experienced firsthand how developments like Zimmerman Lofts can stimulate further investment, turning good downtowns into great destinations. “We are thankful for our strong partnership with the City of Rock Island and Mark Zimmerman and are excited to announce moving forward with the development. The Zimmerman family and business has a 50-year legacy in downtown Rock Island, and we are proud to work with him and the City on this adaptive reuse effort,” says Brian Hollenback, President for Renaissance Rock Island. GROWTH has had the property under option since September 2015. In February. GROWTH submitted a Low Income Housing Tax Credit application to the Illinois Housing Development Authority. If funded, GROWTH anticipates to break ground in fall 2016. Interesting Fact: The development is named after the Zimmerman family that owned a car dealership in downtown Rock Island for over 50 years. Above: Concept of Zimmerman Lofts. Left: Current photo of Zimmerman Honda. The car dealership was a family owned business in downtown Rock Island for over 50 years. It relocated to an outside community in 2011. The Zimmerman Lofts project is an adaptive reuse project that will repurpose an existing vacant building, as well as create 2 floors of new construction. The commercial side of the project could aid in the creation of upwards of 50 jobs, while the construction period jobs supported is estimated at over 140. This project will have a tremendous impact on the community by addressing housing and business needs, while also repairing aging infrastructure.